SSL certificates have moved beyond the ‘Buy’ page. They are embedded in your business. In fact, SSL Certificates are a business-critical part of your IT infrastructure. However, managing individual certificates in a large organization is complicated by multiple locations, many servers, different business units, and rapidly growing Web-based services. The risks of hiccups and problems increases with the number of certificates, including lost sales when customers see security warnings about expired certificates on your site, damage to your brand and consumer trust because of problems with certificates and more. 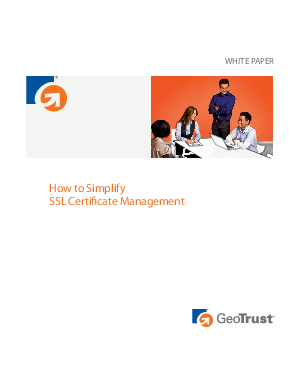 With these risks in mind, this guide provides five simple steps for IT professionals to take control of SSL certificates across the enterprise, and recommendations centralizing certificate management throughout their lifecycle.